When considering overall well-being, most people living in our diet culture today have been sold a picture of “healthy living” that involves rigid rules and an ideology exalting the image of a lifestyle consisting of green kale smoothies, chia seed and avocado “pudding”, loads of lean protein, no eating after 7:00 pm, and never, ever bending to consume the oh-so-evil refined wheat flour, horrid “processed foods”, and for the love of all things good and holy, absolute restraint from indulging in…gasp…the ultimate devil’s child: addictive refined white SUGAR! This “good food, bad food” dichotomy and food scaremongering are problematic to so many people in so many ways. In our modern culture of moralized food choices and diets disguised as “healthy lifestyles,” it’s no surprise people are confused about what the heck to eat and find themselves on a carousel of on-a-diet and off-a-diet as their weights continue to fluctuate or skyrocket. It’s so common to think in black-and-white when it comes to food choices that more and more people find themselves in crisis over what to eat. We’ve detached from our own instincts of what is enjoyable and feels good in our bodies in order to follow a health guru’s recommendations or the latest “lifestyle” craze (Paleo? Whole 30? IIFYM? low-carb? ketogenic? Weight Watchers? ), all of which promise the ultimate in health and longevity, or what most people truly want: their dream body. And for many, the only alternative often means succumbing out of weak-will to the call of the “corrupt food industry’s” junk food sirens. Despite what health and wellness gurus might espouse for our ultimate salvation, there’s an option that we’ve been taught to completely ignore: our own internal body wisdom. Our own body’s hunger, fullness, and satisfaction signals. In a diet culture consumed with finding “perfect health” and immortality, freedom from sickness and the dreaded “obesity epidemic”, we’ve strayed so far away from truly knowing how to be COMPETENT eaters, intuitive eaters, conscious eaters, that it’s no wonder the diet industry brings in over 63 billion dollars a year! This may be a brand new mind-blowing concept, but we were born knowing when we were hungry, how much to eat, and with the internal signaling to identify when our bodies were physically sated, or satisfied. Somewhere along the way, in the sea of hyper-palatable, super delicious foods combined with a plethora of conflicting dietary rules we’ve been led astray! We’ve been falsely led to believe that we can and must have total control of all of our health circumstances and physical outcomes by adhering to any one of a complicated array of dietary protocols. As if we exist in a test-tube with the sole purpose of optimizing our nutrition to master our bodies. Except that we don’t have total control and dieting is not our sole purpose in life. This is why finding our way BACK to sensing in to our own appetite cues – untangling our physical needs and desires from the external noise of experts telling us “eat this and don’t eat that” – is truly a revolutionary, albeit completely sane and sustainable, approach to wellness. 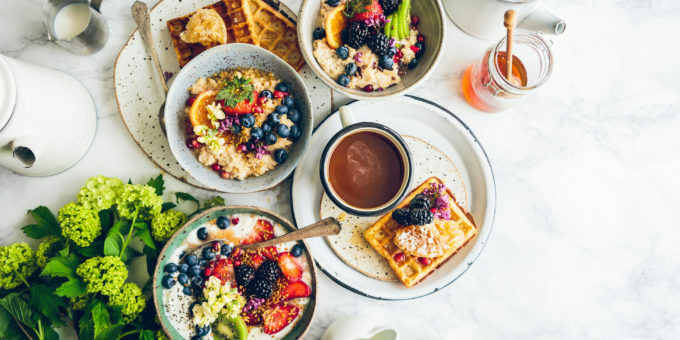 The concept of intuitive eating – eating based on the intersection of internal emotion, instinct, and rational thought – is, in fact, an evidence based approach to developing a healthy relationship with food and body. It involves rejecting a dieting mentality rife with food rules, shoulds, musts, and restrictions, and instead finally learning how to tune in and TRUST your own body and intuition to guide you. Created and pioneered by dietitians Evelyn Tribole and Elyse Reche, the Intuitive Eating approach is now supported by over 60 published peer-reviewed studies as an effective alternative to dieting, macro-counting, “clean” eating, calorie counting, or whatever the en vogue method du jour of food control may be appealing at the moment. Unfortunately, the term “intuitive eating” has been co-opted (incorrectly) by many in the fitness and health world and is sometimes presented as another form of diet and food control, or otherwise is often completely misrepresented as a free-for-all approach to eating that doesn’t take health or nutrition into account at all. Be wary of any interpretation of intuitive eating that promises weight loss or body composition control as this is NOT the intended purpose of intuitive eating despite having gained traction as a buzzword in the health and wellness field. In order to foster a trusting relationship with your mind and body in regards to food choices, it’s important to examine the popular idea that the key to your happiness and health lies in your next diet. If you find yourself in an all-or-nothing space with food, always waiting to “get control” over your eating, your body, your health, your fitness performance, yet constantly find yourself “cheating” on your diet or feeling guilty or unable to sustain the draconian rules that you’re sure you’re meant to follow, then perhaps it’s not YOU but the diet that’s wrong. It’s hard to learn body trust when you’re constantly in pursuit of the next diet or “lifestyle change” to “fix” you. If there’s always a low-grade suspicion or fear that the treats and foods you enjoy will be RIPPED from your life at any given moment at the onset of a new “healthy lifestyle”, it will become paramount to consume whatever you can in a free-for-all whenever you’re between diets. Of course, you need to get it all in before the next bout of restriction and deprivation comes for your favorite chocolate brownies and pizza! Whether this occurs weekly, with weekend binge-fests and “cheat meals” that turn into cheat days or cheat weekends, or 30-day challenge intervals, with pre- and post- challenge binges to match the severity and duration of the diet, the constant allure (or threat) of the next diet perpetuates a pattern of all-or-nothing eating. The thing is, this cycle of dieting and not-dieting tends to lead to heavier body weights and less body trust after repeated attempts over a lifetime. And not only because it leads to “last supper eating” — which is that final free-for-all food-fest preceding every new diet, the whole “better-eat-it-now-because-I’m-about-to-be-deprived-for-the-next-6-weeks!” mentality, but also because there are very real metabolic ramifications that can occur with attempts at food restriction. And in most cases, some of these physiological changes are not reversed post-diet. For a long term healthy relationship to food and your body, rejecting the notion that you need a diet to “fix” you, or that the next diet is going to work long term is one of the critical steps to establishing an intuitive relationship to food and eating. It’s hard to eat intuitively when you’re constantly anticipating a famine. Please let me know what your biggest food struggle is or what you think by leaving a comment or dropping me an email. I love to discuss this stuff! Be sure to continue with Part Two for the next few principles in this four part series, or jump on over to Part Three and Part Four.